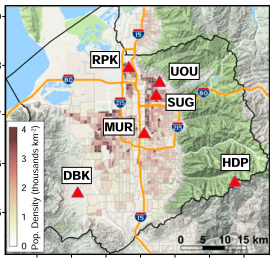 Environmentalists have long been critical of “suburban sprawl.” A study of carbon emissions in Salt Lake City and surrounding areas, published recently in the Proceedings of the National Academy of Sciences, provides new reasons to question excessive suburban growth. Although the study itself does not make policy recommendations, its findings bolster the case for a carbon tax. The study was authored by Logan Mitchell of the University of Utah, together with twelve colleagues from various institutions. The authors note that although urban areas account for some 70 percent of global carbon emissions, gaps remain in the understanding of the spatial distribution of those emissions, in part because many monitoring stations are located far from cities. In this case, however, long-term observations were available from five urban and suburban sites in the Salt Lake Valley, plus a reference site in the nearby Wasatch Mountains. The study found that population growth in rural areas that experienced suburban development was associated with increasing emissions while population growth in the developed urban core was associated with stable emissions. The study, which controlled for natural emissions, atmospheric mixing, and seasonal effects, identified fossil fuel use as the main driver of increased emissions. These findings have clear implications for the choice between a market-based approach to carbon abatement vs. a command-and-control approach. A carbon tax could incentivize greater urban population growth and less suburban expansion in two ways. First, it would increase the cost per mile of driving, thereby raising the cost of living farther from the urban core. Second, since urban residential buildings are more energy efficient than those in the suburbs, a carbon tax would increase the relative cost of heating and air conditioning in less densely populated areas. In contrast, command-and-control environmental regulations would have less effect, or even perverse effects, on locational choices. For example, performance standards for furnaces and air conditioners raise the cost of building suburban homes but lower the cost of occupying in them. Their purpose is to nudge people to choose heating and cooling equipment that have lower long-run costs, but to the extent that they do so, they can reduce the long-run cost of suburban living not just in relative terms, but in absolute terms. Similarly, CAFE standards for automobiles increase the cost of new cars, but lower the marginal cost of driving an extra mile. Once a fuel-efficient car is in the driveway, they decrease the opportunity cost of a longer commute.